A South Carolina ice cream shop has come under fire over a giant Confederate flag in front of its property, but the owner has been fighting a losing battle to have it removed. Tommy Daras opened the Edisto River Creamery & Kitchen in Orangeburg in 2015, but a contentious patch of land outside his restaurant - with the pole flying the offending flag - is owned by group embattled in its Confederate views. The property’s former owner had a chain of barbecue restaurants and raised Confederate flags in all of them, following a decision by the state to remove the flag from the Statehouse in 2000. The former owner, Maurice Bessinger, supported racial segregation and described the Civil Rights Act as “unconstitutional.” He once handed out pro-slavery leaflets at his restaurants. 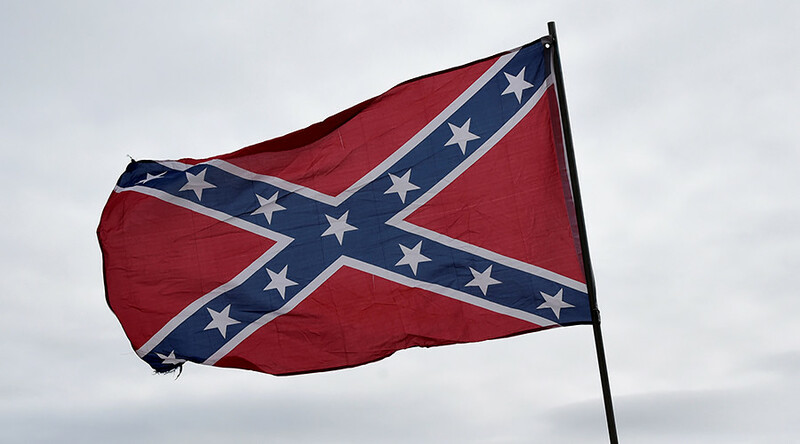 Although Bessinger died in 2014, he sold the patch of land housing the flagpole to the Sons of Confederate Veterans Camp 842 in 2005, and the group has no intention of removing the offending flag from its 130-square-foot (12 meters sq) patch of land. The group says the flag will remain as long as its members are alive. That embattled view has left ice cream shop owner Daras with a difficult problem. Daras was willing to accept the flag’s presence, but weeks after opening, the mass shooting of black Charleston church goers by white supremacist Dylann Roof occurred, and the group decided to replace the Confederate flag with an even larger one. "From that day forward, all hell broke loose for me,” Daras told Fox 8. “My windows were broken out, my phone was ringing off the hook, my employees were harassed. I was fist-fighting with people in the parking lot. Everyone in town assumed it was my property because it looks like it's attached to this building,” Daras said. He attempted to remove the flag in November, but was stopped by members of the Sons of Confederate Veterans, who threatened to have him arrested for trespassing. “I wanted to compromise. I tried to work with them," Daras told Bluffton Today. "But I realized today they are racists and they are bringing down my business with them." Daras has hired lawyer Justin Bamberg, who has argued the flag is on land zoned for commercial use and that its presence violates zoning rules. In June, the City of Orangeburg’s zoning administrator ruled the flag is not in violation and that the city is unable to regulate the flag, the Times and Democrat reported. Bamberg has filed an appeal, saying the administrator didn’t properly address the issue. “I think we made it extremely clear that this was not a challenge to free speech,” he said. "That flag needs to be moved and if there's any possible way that I can do it, it's going to be done,” Daras told Fox8. “Right now, we're gridlocked." "I am very proud of all the men and women, black, white and brown, that fought under that flag in the war for Southern independence," he said. The Confederate flag is a source of controversy over its historic ties to slavery and segregation. Critics claim the flag defends slavery while supporters say it’s about the history of the South.